Winning trivia question: After humans, what mammal is the most widespread in the world? Answer: Orcas! Yes, and one of the best ways to see these impressive creatures is to go on the San Juan Outfitters Whale Watching Tour. Leaving out of quaint Roche Harbor, the Sea Hawk, a mid-sized vessel of 42 feet, embarks on a 3-4 hour journey through the Haro Strait in search of whales, harbor seals, Dall’s porpoise, eagles, and other wildlife. This comfortable boat can take up to 26 passengers with indoor and outdoor seating, a 360° viewing deck, heated cabin, and onboard restroom. 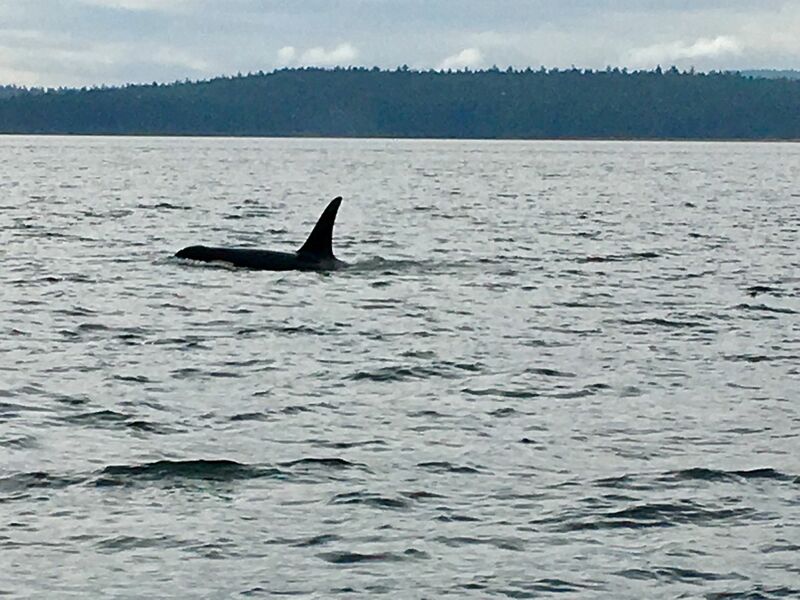 Our recent tour departed with a bit of drizzle that cleared up to experience a glorious day on the water and sighting of resident orcas from the K13 matriline in Canadian waters close to the intersection of Boundary Pass and the Strait of Georgia! The thrill of seeing these magnificent cetaceans (we learned a new term from our outstanding naturalist, Piper, meaning aquatic mammals such as whales, dolphins, and porpoises), out in the wild was magical, especially since there are only 74 remaining Southern Resident Orca. A shout out to our very knowledgeable Captain Sarah, who then smoothly navigated us through the waterways to Patos Island, the northern-most point in the San Juan Islands, where we saw 2 transient whales performing back flips with the picturesque lighthouse in the background. We saw harbor seals lounging in the sun on one of the many small islands, as well as several bald eagles on Spieden Island, the largest privately owned island in the San Juan Archipelago. What an extraordinary day! The TrailblazerGirl team highly recommends the Whale Watching Tours from the folks at San Juan Outfitters – friendly and knowledgeable staff, a small group experience, and an unforgettable adventure on the waters surrounding spectacular San Juan Island!